"This is me Christmas 1975," reader Diane Davis tells us. 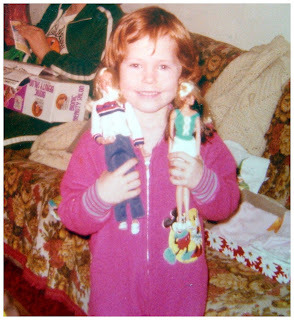 "I scored the Bionic Woman and Tuesday Taylor dolls, both which I still have." Not only that, but if you look real close, behind the li'l Diane, you'll spy a Bionic Beauty Salon, which apparently kept Jaime Sommers in tip-top spy shape. We've been looking for evidence of a Kenner-produced Six Million Dollar Man Beauty Salon or Six Million Dollar Man-icure Station, but so far no luck. If not for Mason Reese's success, would Corey Feldman's chubby cheeks have been in demand? If not for Corey Feldman's chubby cheeks, would Corey Feldman's career have taken off? If not for Corey Feldman's career taking off, would Corey Feldman's life have been more level? Nothing says Christmas like Col. Steve Austin beating down a bad guy in a department store. 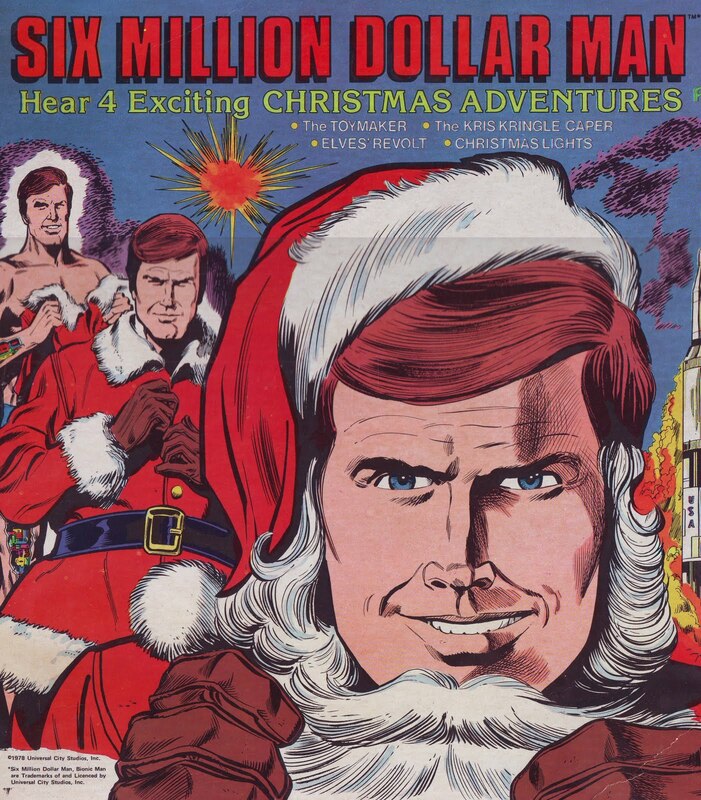 And, of course, nothing says Christmas classic like a poor voice actor doing his best to make kids believe he's Lee Majors. The all-knowing Bionic Wiki has the story behind this effort. A kind YouTuber has uploaded one of its bionic tales for your listening pleasure. "I was so damn excited about the toys. Especially the Stormtrooper blaster. It was killing me having to wait for my mom to take pictures. All I wanted to do was bust open the toys, and start playing." Thanks, Jason, for getting us geeked, too. Got a story and a picture to share yourself? Email away! Done with your unwrapping already? Was it all a blur? 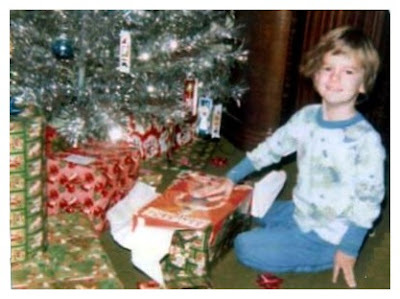 Savor Christmas morns past in our snapshots collection. What Becomes a Legend Least? I don't have a picture of this -- just a memory. It is circa Christmas 1975, and I am a sophisticate! A second-grade Lauren Hutton! I am! I just know it! I, Joal Ryan, have been allowed to stay up to watch The Tonight Show with Johnny Carson. I am soaking in the scene, the clubby chit-chat, the second-hand TV smoke from Johnny's cigarette. I am so insanely mature I could card myself. Except I don't yet know what the term means. And besides I'm too busy. What with watching The Tonight Show. While playing with my brand-new Batman Colorforms set. And lounging in my brand-new inflatable frog. Yes, it's best I don't have a picture of this. "My sister wanted an Easy-Bake Oven, but received the Suzy Homemaker version instead, and she flipped her lid, but my parents made her take this picture smiling! If you knew her you could tell she was straining and faking the smile!" Thanks, Frank, for sharing this classic tale of photo-album boosterism gone amok. Email us your stories and pics, too. This is me and my sister Val at my grandparents' house in Oshawa, Ontario, and it's 1974. My grandparents on my dad's side are of German descent, so we opened all our presents on Christmas Eve, which is pretty agreeable to a 4-year-old. 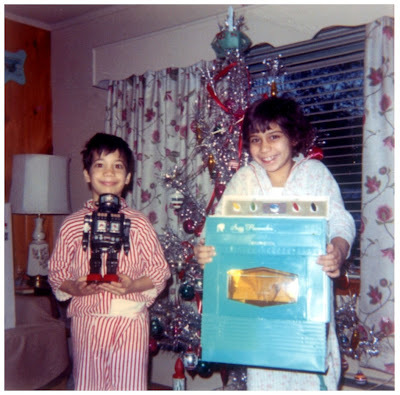 When my sister and I entered the home, we were allowed to open our stockings, which had fun stuff in them like the fire helment and classic Steif stuffed animals shown. But then we sat down to dinner, which was AGONY. Email us your Christmas pics. Join in on the fun! 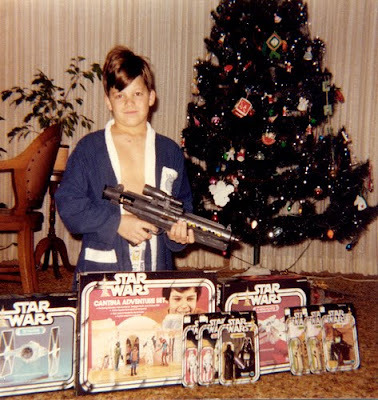 "I was thrilled to get Stretch Armstrong. I played with that thing all the time ... until it cracked, and gooed all over the place." 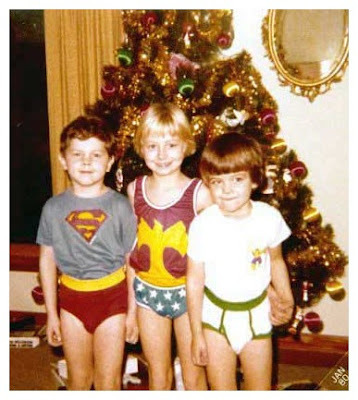 -- John Hildman on Christmas 1977 in Sioux City, Iowa. Oh, John, how I know your pain. I think all of us who had a Stretch doll in our lives had a little of that crimson corn syrup on our hands. Thank you, John, for letting us see your Stretch. Email us your pics, too. "What a bleak, stark, year," Andy Frueh said of Christmas 1979. Due to the tough economy (that sounds familiar...), Andy doesn't remember he and his siblings getting much. "But at least we had Underoos," he said. The Hulk set paled next to the brightly attired DC Comics heroes on that Christmas morning in Lima, Ohio, but Andy truly was the man of the hour thanks to Bill Bixby. Thank you, Andy, for sharing this awesome story and image. Email us your pics, too. Snapshot No 7: Anarchy, Sorry, Hoppity Hops in the U.K.
You say Hoppity Hop; our friends in the United Kingdom say Space Hopper. (Oh, those theatre-going Brits -- they just have to be different, don't they?) On any continent, the big, rubber bouncy ball was a big get, circa 1970. And so it was for future U.K. blogger/historian Derek Tait (above). 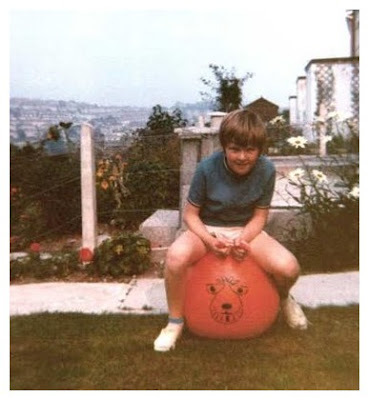 Now, if Derek is secure enough to send in a snapshot of himself poised on a Space Hopper, then what is stopping you? Email us your pics already. And, yes, in the name of fairness, we're open to Hoppity Hop art. -- Brian H. & Joal R.
Are you a Santa doll expert? Even better, are you a naked Santa doll expert? Do you know when this lovely Fibre-Craft naked Santa doll (Model No. 3104) was first sold? Given that it was manufactured in Hong Kong, and is weird, frightening and wrapped in crinkly plastic, my guess is that it is another fine product of the 1970s, but that's only a guess. If you have an answer, please let us know at xmasinthe70s [at] yahoo.com. I was going to ask why Santa is bottomless, but then I decided I don't really want to know. "Mom, it's just not Christmas around here until we hang your discarded pantyhose containers on the tree." A Dead Santa of a "Simpler Time"
Now, I must say, I like people, like Beck, who remember the 1970s as a "simpler time." This is because they make me laugh. 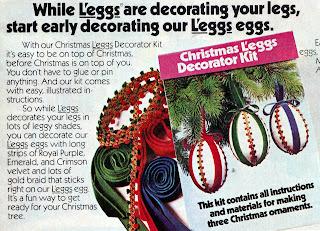 Of course, they also make me wonder if they actually remember the 1970s. The real 1970s. The decade that, like any decade, was good and bad and weird and great and awful. 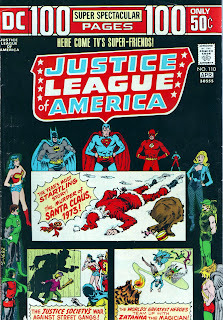 The decade that killed off Old Saint Nick -- and a shamefully malnourished one at that -- just in time for the holidays, not to mention the pages of Justice League of America No. 110. Merry Christmas, kids! Now go outside, and play with your lawn darts! And remember, or better yet, forget, in 30 years, this'll all seem "simpler!" Not sure if the script is legible, but it says, "Christmas is more than an Orange..."
Now, why it says "Christmas is more than an Orange," I have no idea. Then again, I'm not a theologian. Or a citrus farmer. It's not clear from this classic TV Guide "Close Up," but this particular All in the Family -- about a deadly hate crime against a female impersonator, and involving a main character's renunciation of faith -- aired on Christmas night. Yes, Virginia, broadcast-network TV used to have (how should we say?) Sno Balls. Not to mention the will -- and the audience -- to air all-new episodes on a major holiday. 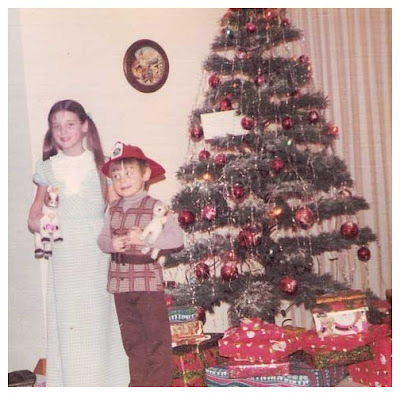 Just a reminder, if you have snapshots or other artifacts from Christmas in the 1970s that you'd like to share, send 'em our way at: xmasinthe70s [at] yahoo [dot] com.